Besides the main attractions you just have to visit in Santa Cruz, there are always some great Santa Cruz events going on. Use the list below to find out what’s going on NOW and don’t forget to check the list of best annual events. To post your own event in Santa Cruz, let us know from our contact page and once approved we’ll add it to this page. Chocolate tastings from more than 30 area vendors, live jazz, as well as several gift items for sale. Free festival admission; tasting tickets are $12 in advance and $15 at the door; monies benefit reentry student scholarships at UCSC. Not all of Santa Cruz County’s organic treats are found at the Farmer’s Market. The Symphony performs two of the greatest works for organ, Poulenc’s Organ Concerto and Saint-Saens’ Organ Symphony, with San Francisco Symphony organist Jonathan Dimmock. Join the Ohlone Audubon for an extraordinary birding opportunity in Neary Lagoon. Come watch wacky chefs compete for the title of best clam chowder at this annual fundraiser for Santa Cruz City Parks and Recreation! One of the more delicious Santa Cruz events! Become the educator you were meant to be! The Santa Cruz Half Marathon consists of a 13.1-mile run/walk along scenic West Cliff Drive past breathtaking vistas of the Pacific coastline. The Santa Cruz 10K Run/Walk consists of a 6.2-mile journey along scenic West Cliff Drive past breathtaking vistas of the Pacific coastline. and Benchlands behind the County building. This exciting community event provides educational information, live music, and activities for the kids including an arts and crafts tent. 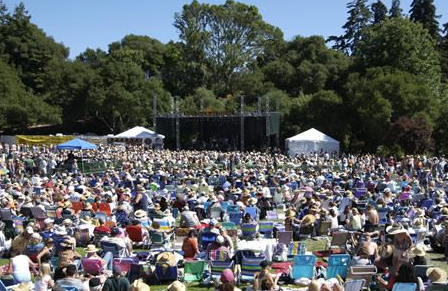 Top names in blues and roots music for two days in a natural amphitheater surrounded by oaks and redwoods near the Pacific Ocean. State-of-the-art sound system and staging. Artist booth for audience meet-and-greet and autographs. If you are into blues music, this is a Santa Cruz event that you don’t wanna miss! Come celebrate the surf spirit and classic surf wagons as more than 200 “woodies” predating 1950 line the Santa Cruz Wharf. Free admission and free bike valet. Saturday, June 23, 2012, 10 a.m. – 4 p.m.
Sunday, August 26, 2012; Races start 9 a.m. and the festival starts 11 a.m. Discover the excitement of outrigger canoe racing at the Santa Cruz Wharf. This free festival provides a taste of the tropics with fresh flower leis, Hawaiian shaved ice, and hula dance performances. Bring your little witches, goblins, monsters, and ghosts to this free and safe trick or treating event at Santa Cruz Wharf businesses. Wednesday, October 31, 2012, 4:00 p.m. – 6:00 p.m.
Additional events to be posted. Contact us to post your event.